From beautiful beaches to a thriving biomedical community, San Diego has a lot going for it. Now another phenomenon is boosting the city: San Diego’s economy is riding high on a wave of suds. A balmy breeze with a slight undercurrent of chill is blowing in off the Pacific while the setting sun turns the sky a soft orange in San Diego’s Little Italy. The scents of garlic and lemon zest linger in the air as laughter and conversation echo from the neighborhood’s restaurants and bars. Suddenly an odd image comes into view: A wagon-like contraption with bike pedals fitted for a party of 12 slowly trundles through, powered by revelers on a rolling tour of the breweries that line the city’s streets. At each brewery on each subsequent block, participants dizzily dismount from their pedal-driven wagon, put a $10 bill on the bar and drive brewers’ profits a bit higher with every sip of sour or quaff of floral IPA. Where a city like New York has a deli or pizzeria on every other corner, San Diego has a craft brewery. A few hundred miles north in Chico, Calif., at Sierra Nevada Brewing, is where craft brewing as we know it got its commercial start in 1979, but the industry has matured in this Southern California paradise. Tasting rooms with bountiful rotating drafts abound, and craft beer has joined surfing and San Diego’s zoo as one of the city’s biggest tourist attractions. But San Diego’s craft brewing industry extends well beyond tourism, generating about $1 billion of revenue for the local economy every year. Beyond the suds and the suntanned drinkers, there is a massive economic engine, almost 30 years in the making, built around beer in San Diego. By the early-to-mid-1990s, a handful of other breweries, including Pizza Port, Coronado Brewing, Home Brew Mart and Stone Brewing, had entered the scene. These early breweries established the quintessential San Diego craft beer style—big brews with aggressive hop profiles, fresh aromas and a finish with just the right bite of bitterness. They also became the core of the local brewing industry. The breweries were bolstered by an earlier, grassroots phenomenon: the rise of a passionate and diverse home-brew community. California in the 1970s had lots of free-spirited residents who liked to brew their own beer, and San Diego, with its outdoorsy surfer culture, was a locus for such DIYers. But federal law mandated that anyone who brewed beer had to pay taxes on their product. The home brewers managed to organize sufficiently to convince California senator Alan Cranston, a Democrat, to insert an amendment into a tax bill—the now beloved-among-home-brewers HR 1337—that eliminated the tax for any household brewing 200 gallons or less. On October 14, 1978, president Jimmy Carter signed the bill into law, and a home-brewing ecosystem, rife with clubs, competitions and certified judges, sprang up in San Diego in short order. The home-brew groups are San Diego’s brewing farm teams. They incubate and nurture the talents of the city’s most promising brewers, many of whom go on to open their own professional operations. “A key factor behind our early success was the high density of home brewers in San Diego—they got what we were doing immediately,” Rattner says. The regular communication and collaboration between the home brewers and the pro brewers helps create a culture of innovation. 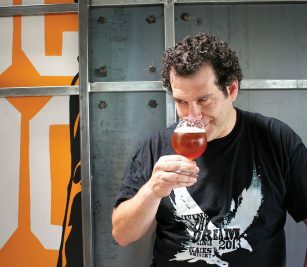 “Many of the home brewers who have never gone pro continue to challenge pro brewers to experiment with different styles,” says Harold Gulbransen, a former president of QUAFF, or the Quality Ale and Fermentation Fraternity, the largest of San Diego’s home-brew groups and the second-largest such group in the country. San Diego is now home to 143 breweries, nearly one-fifth of all the breweries in California, and the number is rapidly increasing. Between 2009 and 2014, the number of breweries in San Diego nearly tripled—from 32 to 90—and since then, the count has risen by roughly two dozen every year. Four of San Diego’s breweries, Stone, Green Flash Brewing, Ballast Point Brewing and Karl Strauss, are among the country’s top 50 craft producers by volume. The growth of these large brewing companies—and the proliferation of dozens of great smaller ones—has powered remarkable growth in San Diego beer tourism and beer sales. In 2015, the most recent year for which data is available, the National University System Institute for Policy Research reported that beer sales in San Diego totaled $851 million, with another $400 million from the brewing industry in estimated economic benefit to the county. In the past seven years, direct employment in the San Diego brewing industry has grown more than 418 percent, according to the San Diego Regional Economic Development Corporation. Estimates for this year put San Diego at the $1 billion mark for beer sales alone. The beer tourism boom has made Stone Brewing World Bistro & Gardens in Escondido the third-most popular destination in San Diego’s North County, right behind the zoo’s Safari Park and Legoland California Resort. The brewing industry directly supports more than 4,500 jobs in San Diego County and has spawned numerous related businesses—everything from water management consultants and safety experts to architects, engineers and stainless steel brewhouse builders and suppliers. Many local farmers use spent grain and yeast slurry from the breweries to feed their livestock. AleSmith owner Peter Zien makes artisanal cheese from milk he gets from a dairy farm that uses his grain and slurry. The presence of one of the world’s largest yeast providers, White Labs, also played a role in the rapid growth of the city’s craft beer industry. White Labs—which began producing yeast for Home Brew Mart (later becoming the much-lauded Ballast Point) when it was founded in 1992—was at the forefront of the San Diego beer revolution. 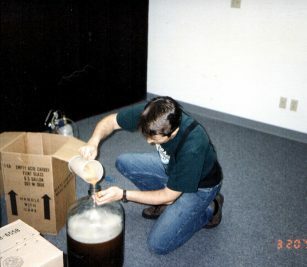 White Labs helped drive much of the early innovation creating the San Diego style, and works directly with local brewers to develop yeast strains that produce specific flavors and styles of beer. 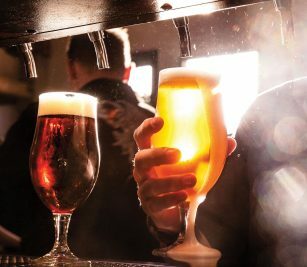 Another breakthrough for the craft brewing industry came when White Labs began releasing pitchable (ready to use) strains of liquid yeast in the mid-1990s. The pitchable yeast was easy to use and easy to store, reducing the learning curve for new brewers entering the industry. Today, the company stores and maintains more than 700 proprietary strains for breweries, supplies yeast to the majority of San Diego brewers and sells to more than 60 countries from six locations around the world. By 2010, a little over two decades after Karl Strauss opened, more than 35 breweries were operating in San Diego County. That year, San Diego brewers took home more medals than all of Germany, Belgium or the UK at the World Beer Cup, essentially the Olympics of beer. It was the city’s Judgment of Paris moment, a turning point in San Diego’s reputation as a real brewing force. (It was at that same World Beer Cup that San Diego’s Ballast Point won Champion Brewery, Small Brewing Company category, and its Sculpin IPA won a gold medal, crowning it the world’s best IPA.) Thanks to rising demand for San Diego–style beers abroad, Stone opened the first American craft beer brewery in Berlin in 2015. All the adulation for San Diego craft beer did not go unnoticed by Big Beer, the massive, multinational companies that have faced waning demand for their less flavorful products as Americans’ beer taste has grown more sophisticated. In September 2015, MillerCoors acquired Saint Archer Brewing for $87 million—the first acquisition of a homegrown San Diego brewery by a big corporate entity. The transaction sent shock waves through the craft community. It drew a line in the sand between San Diego’s independent craft breweries and a new breed of craft breweries acquired by big corporations. The debate over how San Diego’s small and independent breweries coexist with corporate interests continues today; 10 Barrel Brewing, the brewpub owned by AB InBev, the world’s largest brewer, recently opened downtown, and others will soon follow. Either way, it’s become clear that the San Diego style of beer, whether as part of a multinational conglomerate or an independent business, has gained a national and international foothold. Soon, San Diego will have an entire brewery devoted to beers that reflect influences from both sides of the border, SouthNorte Beer. According to founders Ron and Rick Chapman, the new brewery, scheduled to open later this year, will be an “American brewery that blends the rustic flair of Mexico with the art of San Diego craft brewing.” And that very well may be the San Diego craft beer industry’s best defense against being swallowed up—by growing and changing on its own terms.